AD today warned that nominee companies and fiduciary services in Malta were being used as a means to cover-up foreign criminality. 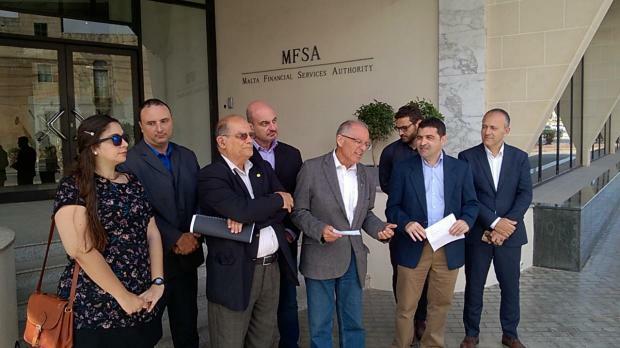 Addressing a press conference outside the MFSA, AD spokesman Ralph Cassar requested an independent inquiry into the accusations being levelled against the island in the Malta Files. Research by a group of investigative journalists found that letter-box companies in Malta were used by the Italian mafia, Russian loan sharks and the highest echelons of the Turkish elite. He said fiduciary and nominee services attracted tax evaders and criminality. Such services disguise who the ultimate owner of a company is. Mr Cassar said the MFSA’s human resources should immediately be increased, and its board appointed by a two-thirds parliamentary majority. AD Chairman Arnold Cassola hit out at the “evident” conflict of interest MFSA chairman Joe Bannister had. Apart from heading the regulatory body, Mr Bannister was also the deputy chairman of Finance Malta. Profs Cassola said this meant that Mr Bannister was the person tasked with both attracting companies to Malta and advising them about the tax rebates available to them, as well as carrying out the necessary due diligence checks on the same companies he himself attracted to the island. “Foreign MEPs find this unbelievable. He should be removed from one of these posts”, Profs Cassola said. The AD chairman called for a public list of all beneficial owners of Maltese companies in order to eliminate the secrecy behind fiduciary and nominee companies. He said the Panama Papers scandal involving Keith Schembri and Konrad Mizzi had served to bring this unwanted attention on Malta. Profs Cassola questioned how a person with no prior banking experience was given a license to operate Pilatus bank in just 12 weeks. He asked whether the bank was given preferential treatment, or whether there was a more deeply ingrained flaw in the system. He said the MFSA’s structures and resources had remained unchanged for the past 12 years.